If you are willing to promote your product or services by online advertisement. Then join us we will advertise your promotions in best possible way. Reach many potential customers through our website and let them find your offerings through the ads you have with us. Pay only when ads are clicked and people visit your website. Get your Ads on Finysel Today. Why use Finysel Advertising ? Bring more visitors to your business or website. Attract a diverse group of people that are interested in what you do. Already using our business solutions try advertising to reach even more number of people. Choose a comfortable budget, change your ads to different look any time and target specific niche groups, country or city. Make all these easy customization benefits you and get more conversions for your business every time. Advertising on our website is very cheap and you get started with any low budget. Pay only when users clicks and visits your website. No visit no fee that means you can have more users that actually are interested in your business or service. Advertise without any problems in best possible way. We can set you going with all supports needed for advertising. Use our forums for any help in advertising or raise tickets for any technical difficulties. Reach many potential customers and let them know about your business or services. Advertise with us, choose the best plan or budget for your business and advertise with ease using all the advertising work done for you. Pay only when users clicks and visit your website. No visit no fee. Advertising with us is really simple. Just choose your budget and send us the required details for registering your advertisement with us. Once approved you can pay us and provide the advertising codes or graphics or you can let our team make a advertisement for your business or service and advertise on our half. Your ads are customized based on your target country, city or group of people and it runs on our website till you budget is completely utilized. However you can re-activate your ads again within 15 days by paying us the money up to the date till which you want us to advertise your ad. Ads are prioritized based on the bid rate if the ads you advertised with us has higher bid rate than the other ads of similar category then your ads appear first than other similar ads. So setting a competitive bid rate gives you more exposure than similar business ads we have with us. Your ads are costed based on the user visit to your website or business info pages. If users click and does not visit your website you are not costed anything. That means no visit no fees. And ad impressions are really very cheap. Change your ad anytime according to your need and changes are easily made on the contact details, website or other information about your business and its ad. Being a Business and Service Owner you choose to promote using advertisement. We showcase your ads in the ad space columns available in our website. Based on the content keywords and user impressions your ads may appear to users who visit and browse our website. If Users find your ads useful they will click your ad and will visit your website or any services you are offering. Partnered with various Ad serving units like Double Click for Publishers by Google, Revive Adserver etc. we customize your ad impressions so that they appear only to the people who are interested in your ad campaign. You only when someone clicks on your ads and when certain ad impression count is reached. Get insights and reports from dashboard that is customized for advertisers only. Your Ads are shown in our online shop, classifieds, magazine and forums. Ads are shown only to niche specific people with matching interest and search terms. Make more profit and increase sales advertise on finysel today. Choose your budget and get started with advertising. Fill the form and send your request to us. Once approved we will start advertising your ads immediately. Do I need to pay immediately ? Yes, Unless you pay the fees the ads will not be shown on our website. How long will my ads will be serving ? It will be serving based on the amount you have chosen to keep it running. Based on impressions and clicks the ads serving on website are charged. Will I get to know of my Ads Performance ? 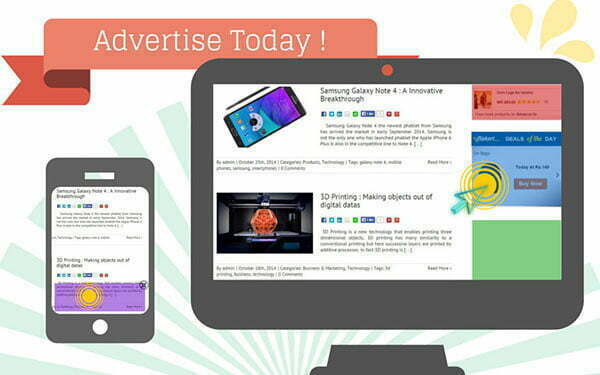 Yes, you will be added to our Ad serving platform and will be informed of your ads and its cost by detailed reports.